There are always ways to make places safer when it comes to permissible access. Sometimes we may find it difficult to think of ways to make safety and security subtle yet announced. Security badges and IDs are a few ways safety can be accomplished, but they can also be a hassle. Most companies, when focusing on security and safety, think about the vehicles, surveillance, and alarms. When most security companies use the convenience of vehicles, there is one way to make access simple and clear. Hang tag parking permits. These little hang tags don’t just deal with security. Many companies will find the customer hang tag parking permits very handy and convenient when verifying company vehicles. Check out our Spring Sale for savings on Custom Plastic Hanging Parking Permits and Parking Permits in the following link. Approx. 2 3/4" x 4 3/4"
2 3/4" x 2 7/8"
BBB Member since 2004 with a proven record of complaint free customer satisfaction on items like Custom Plastic Hanging Parking Permits. Click on the BBB logo above to check our record or leave a customer review. If you are in the market for Parking Permits, give us a call today and you will soon realize why after 24 years we still have an A+ BBB rating! At deSIGNerySigns.com we have more than 24 years experience in designs for our Parking Permits. Call us today and let our design specialists help create your next project to promote your product or business. 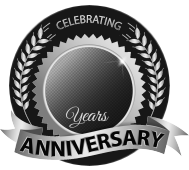 FREE Shipping on all decal and sticker products | Free layout | A+ BBB rating | 24 years in the business | Call Today for a free quote on Parking Permits. Many companies and public recreation parks can use hang tags for access and permission to be there. It is easy and non-permanent for your customers to display the hang tags on their rear view mirror of their vehicles. Libraries find them useful for their staff to make sure parking is specifically marked and the correct vehicles there. Schools can easily identify students and parents vehicles so no vehicle goes unnoticed. The hang tags are available with different laminates and print colors so that your custom hang tag is a one of a kind. They are available in .015” and .035” white polyethylene, and .035” poly with reflective vinyl. Having the reflective laminate on your hang tags can lower the possibility of the hang tag being copied, forged or counterfeited. We do also offer a .035” white recycled polyethylene which contains up to 70% post-consumer recycled materials. 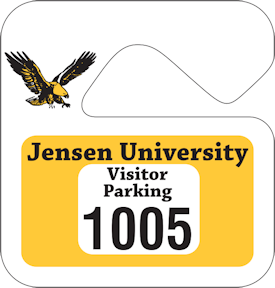 While the custom parking permit mirror tags are available in many different shapes and sizes, they also feature consecutive numbering. Each number creates the possibility of the hang tag being assigned to a specific person, which means a more convenient way of keeping security top notch. 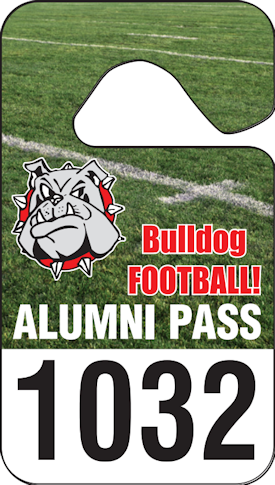 Consecutive numbering is also a great way to notice fake or counterfeited hang tags by them not knowing what numbers you use. This feature can be very crucial and important for the safety of your community. The consecutive numbering is also available in a few different ways. We offer numbers in sizes of 7/32”, 3/8”, 1/2”, 3/4”, and 1”. The numbers are only in black ink for best visibility and printed in only one spot. You can have the numbered parking permits start at any number and end at any number with the numbers in between being in order. If different consecutive number colors or additional number placements needed, that is available at an additional cost. 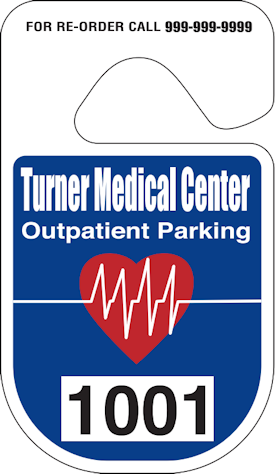 Consecutively number parking permit hang tags are very convenient and safe for your customers. They are easy to use, hassle free and mess free. They are temporary and easy to remove when they are not needed. 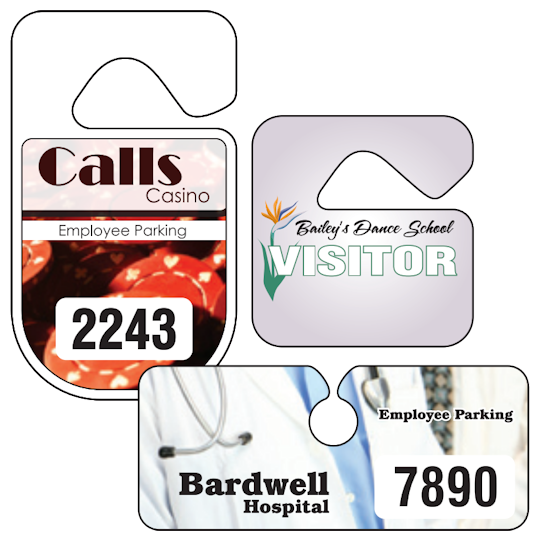 Provide your staff, students and employees with the convenience of these competitively priced hang tags. parking permits are very important in order to know who is accessing your property or work environment. They are easy to spot, easy to read and easy to use. Contact us today for a free sample of our consecutively numbered parking permits so you can test them out and see how they will work for you. Our high end mirror tags are sure to please and organize chaos. With such an in depth product, it is best to contact us so that each feature can be reviewed to you correctly. If you have an idea of what you would like or need, you can send it in to us for a free quote. 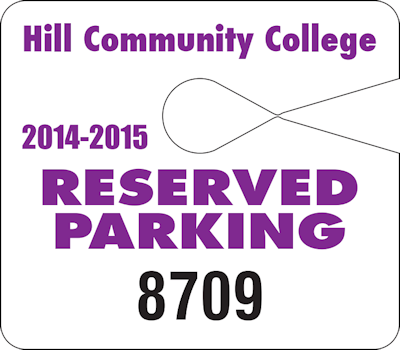 Know who is in your parking lots with our consecutively numbered hang tag parking permits and keep your security on its toes!